In this post you'll hear from Wayfinding Academy Founder & President, Michelle Jones, about post-graduation steps for students, including the option to continue their education at a four-year college. In 198 days, the first-ever cohort of Wayfinding students will graduate. Weve started planning what a Wayfinding graduation will include with a blend of recognizable traditions from higher education and elements that are uniquely Wayfinding. For the next few months, our crew, faculty and these students will be focusing a lot on their next steps and helping them be prepared for success in whatever they choose to do after Wayfinding. One of the challenges we take on with our model is helping students prepare for whatever they decide they want to do next no matter what that is and not assuming they will all do similar things to one another. This means we might have one student who wants to start a non-profit helping youth find their voice through dance and another who wants to become a high school science teacher, and we have to be prepared to help them both. The elements of the Wayfinding program were intentionally designed to help students build skills that are useful to them no matter what they choose for their next step. So students get to practice things like asking good questions, collaborating with others, and understanding what it takes to do something epic through the core curriculum and Labs. 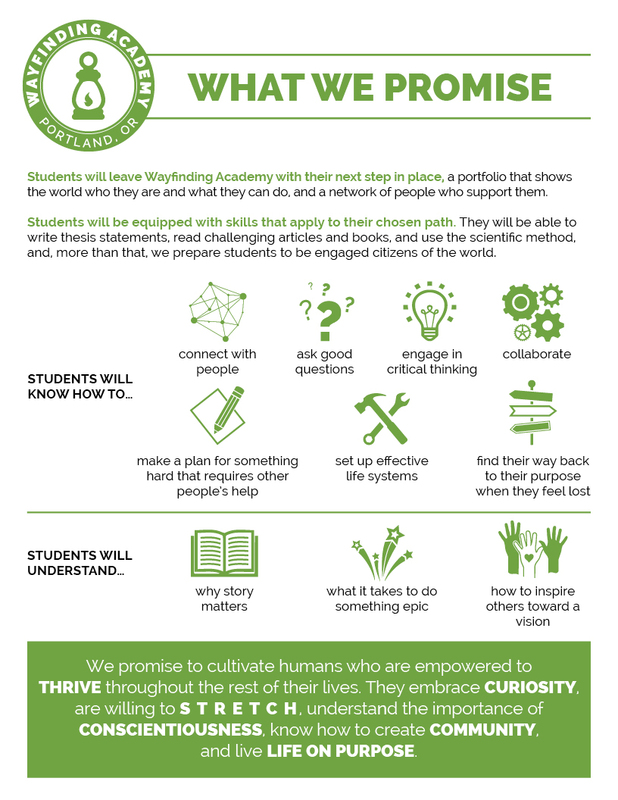 And the Guide program as well as the overall Wayfinding experience helps students feel empowered to thrive, embrace curiosity, stretch, and live life on purpose. As we approach our first-ever graduation, we will be evaluating ourselves to see whether the model we designed can achieve all the lofty goals we set out from the beginning and we eagerly await our students’ decisions about their next steps. In the meantime, our team continues to do outreach to form relationships that will help them on their paths, including establishing transfer agreements with 4-year colleges for those students who want to make that their next step. Because we are authorized by the Oregon Higher Education Coordinating Commission as a degree-granting institution, our degrees are transferable to 4-year colleges, but the transfer process can be quite frustrating for students in the traditional model even under the best of circumstances. So, we are intentionally cultivating relationships with other like-minded colleges where we think our students could thrive and feel at home after their Wayfinding experience. So far we have transfer agreements in place with Prescott College, College of the Atlantic, and Goddard College and, as you will see in this week’s “This is Wayfinding” video, we recently visited The Evergreen State College to talk specifically about one of our students who wants to continue his science education after Wayfinding to create a customized transfer arrangement for him. As we approach the college graduation season, the role for any of us who are connected to a student at any college who is making decisions about their next steps is to be curious, open, and willing to play a supportive role. And to help students take these decisions with a lot of information and intention and remember there is no “right” answer to the question of what they should do next - just a next step in a direction they want to go. At Wayfinding, their final course in the core curriculum during the spring, “The Good Life”, will help them map out that future for themselves. P.S. For those of you who might be wondering about the status of our application for regional accreditation with the Northwest Commission on Colleges and Universities (NWCCU)...the application is complete and standing by ready to be mailed. We completed it in October as soon as we were eligible. Then we got word from them that they are having some leadership turnover and are not accepting applications at this time. It was a frustrating note to get since we worked on the application for several months and have been waiting patiently for two years to submit it, so we will continue to push to submit it as soon as possible. It is a continuous challenge to engage with higher educations’ bureaucracies and strike a balance between being acknowledged by the system and wanting to change it. Stay tuned for more updates.